This school year has been CRAZY. Crazy busy. Crazy exhausting. Crazy good. Crazy, crazy, crazy. The other day, I was feeling a bit overwhelmed with the amount of stuff I had to get done. But, at the same time, I just needed to take a bit of a break. My students leave at 3:05, but our contract time doesn't end until 3:30. So, one day with 25 minutes to fill, I decided to tackle one of the puzzles I had typed up this summer for my puzzle table. This equilateral triangle puzzle comes from Puzzle Box, Volume 1 (affiliate link) from Dover Publications. This is the first book in a series of three puzzle books that are edited by the Peter and Serhiy Grabarchuk. This specific puzzle is by Richard Candy. 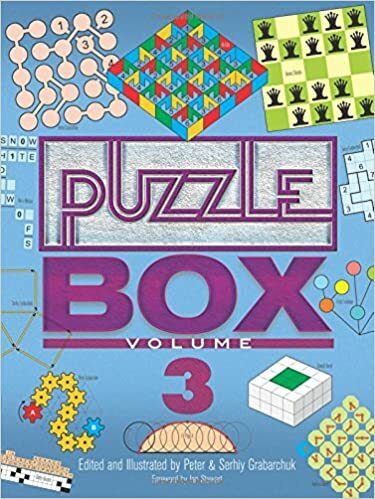 Each volume has 300 puzzles, and I have found over a hundred puzzles between the three volumes that I would like to adapt to use in my classroom some day. 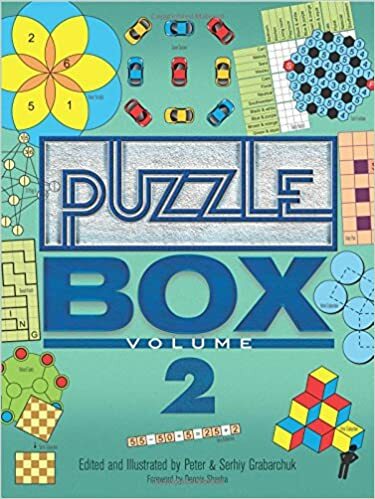 If you love puzzles or if you are looking for resources to teach your students to reason logically, Puzzle Box, Volumes 1-3 (affiliate link) are the books for you! You can get a great taste of what types of puzzles they have to offer you and your students by looking at the free Amazon Preview! Just click the "Look Inside" button for each book. If you're logged into Amazon, you can click "Surprise Me!" on the left side of the page. This will let you see quite a few of the puzzles inside the book for free. I typed up my first Puzzle Box puzzle from the free preview. Then, I did some more looking around and knew I had to order it! So, how does the puzzle work? You are given six quadrilaterals. These are printed on three different colors of paper. 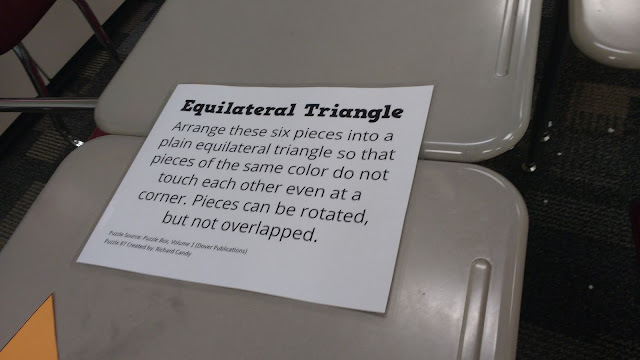 You must arrange the six pieces to form a plain equilateral triangle. Pieces of the same color are not allowed to touch each other, not even at a corner. Pieces can be rotated but not overlapped. As I started trying to solve this puzzle, I went through several thought processes. 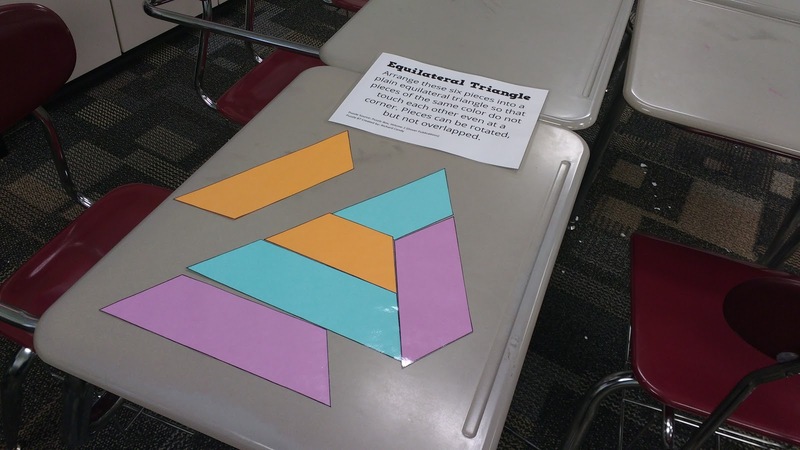 How in the world is this going to make an equilateral triangle? Nope. This is impossible. 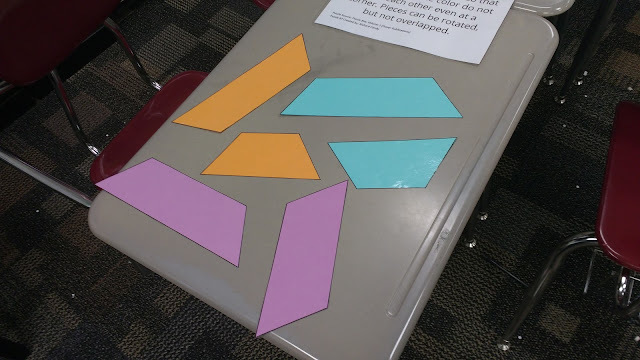 There is no way these pieces could make a triangle. Maybe I made a mistake when I created the pieces in Microsoft Publisher. Wait...what if I try this? Oooh...I'm so close. Maybe this is possible. What happens if I move this here and another piece there and... I got it! Now, I just have to add that to my never ending to do list! Want to try this puzzle yourself? I have uploaded the files here. Great puzzle, thanks for the file, I'm going to try it with my kids! 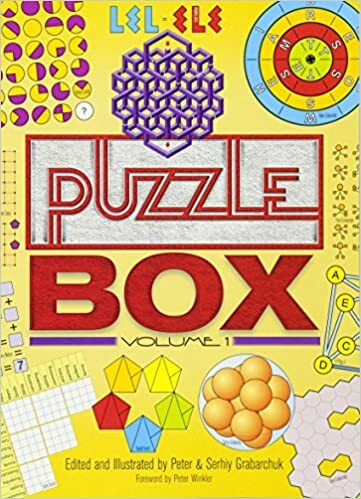 I always kept a bin of puzzle books for my high school math/science students to use when they had a spare few minutes, they are a great way to encourage cognitive flexibility. I like the idea of using magnets to put the pieces on the white board, then students can work together on the puzzle when coming in and out of the classroom. Or, even put the pieces on a table outside the classroom during conference time and let parents try it themselves to get a sense of what their students are able to accomplish! Thanks for sharing and the screenshots Sarah! my sister loves puzzles so much. she is 7 years old and she can make 1000-2000 pieces puzzles. even i cant do that. but i want to buy her different, interesting puzzles. where can i find them?